Nature’s Re-Creations is committed to supporting others and making a positive impact on the local community. We take pride in our active role in the community and are continuously utilizing our skills to benefit the good of others. In 2011, Nature’s Re-Creations was awarded a contract by the Missouri Conservation Department to renovate an existing water feature at the Powder Valley Nature Center in Kirkwood, MO. We designed and installed a 1,500 gallon RainXchange System and a 45’ pondless waterfall as well as a constructed wetland/bog area to enhance the center. This new system captures water off their back roof and is stored in the ground to be reused for feature sustainability, landscape irrigation and education for the community to raise awareness about storm water issues that exist in our area. Visit their location anytime to view this incredible feature that was installed. In June of 2010, Nature’s Re-Creations donated a 500 gallon RainXchange System and bubbling rock fountain to one lucky winner of the contest held by a local radio station. Contestants had to submit reasons for why they felt they were worthy of this prize along with other sustainable landscape additions. The winners located in St. Louis City had recently purchased an old warehouse and were in the midst of renovations to make it a more "Green" home and space in the middle of the urban jungle. The homeowners were extremely grateful and received a complete makeover from several landscape firms who transformed their space. Our rain water harvesting system was designed to capture water off the large warehouse roof and store it underground for the homeowners to reuse to irrigate their new native plantings as well as reduce storm water runoff. 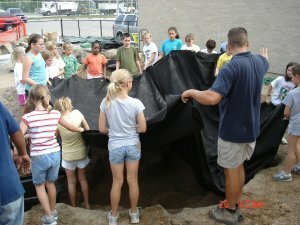 In July of 2009, Nature’s Re-Creations participated in the first ever "Extreme Green Community Makeover" put on by Aquascape, Inc. An entire neighborhood received a green makeover by incorporating rain water harvesting solutions, native plantings, pervious patios, LED landscape lighting and more. Residents of Lakes of Bliss Woods in Sugar Grove, Illinois reaped conservation benefits when Aquascape contractors from across the nation “green” their community. Ed Beaulieu, chief sustainability officer for Aquascape, Inc., and his wife Ellen, initiated the Extreme Green Community Makeover in their neighborhood and received an overwhelming response. Over 30 rainwater harvesting projects were slated for the Extreme Green Community Makeover and included ecosystem ponds, rain gardens, RainXchange™ Rain Barrels, and the RainXchange™ System paired with a Pondless® Waterfall, decorative fountain, or pervious pavers and fountain. LED lighting installations, native plantings, and permeable patios were incorporated into the residential landscapes. A large aeration system was added to the community’s retention pond and native plantings were added to the banks of the pond. In September of 2007, we were able to give back to our local elementary school by educating the students and staff of Truman Elementary. Nature's Re-Creations helped to install the district's first "Ponds for Kids" sponsored water garden. About 15 Student Council members worked alongside Nature's Re-Creations to install a beautiful 10'x12' pond with a 12'-15' stream and three different waterfalls. The students not only learned about ecosystems, but they received hands-on experience installing each component of the pond system. We enjoyed teaching the students at Truman and look forward to our next "Ponds for Kids" event. If you know of a potential school that may be interested in participating in the program contact us and we will send you a detailed packet of information to explain the program. In late September 2007 Nature's Re-Creations, LLC teamed up with other CAC's across the Nation to build a pond for a local war veteran in Eureka, MO. The entire project (labor & materials) was donated by the Pond Guys Peer Group (PGPG) along with other Aquascape related distributors. PGPG felt so fulfilled from doing something for someone who has given so much for our Country that we all tentatively scheduled another build potentially for sometime in 2008.